According to Fox23.com, two 20-year-old music fans who attended this past weekend's Rocklahoma festival in Pryor, Oklahoma are missing. 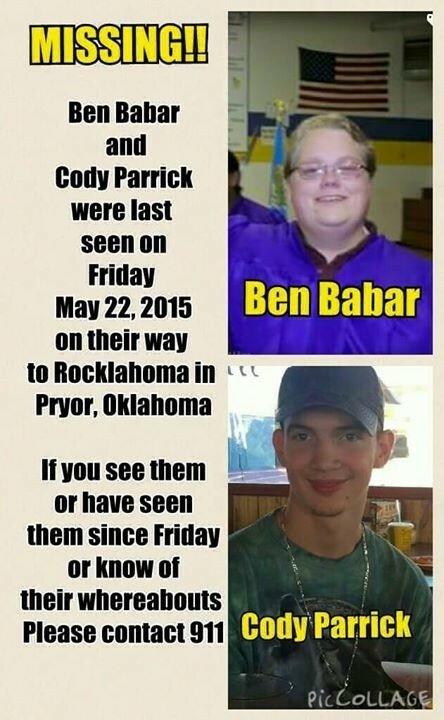 Cody Parrick and Ben Babar were last seen Saturday (May 23) when they were supposed to leave the event for work but never made it. They were also seen the previous night at a leather store in Weleetka. Babar's uncle told Fox23.com that the two were driving a silver 2005 Pontiac Montana minivan. Anyone with information concerning the two men's whereabouts is asked to contact the Okmulgee Sheriff's Office. Due to the inclement weather, the organizers of Rocklahoma festival canceled several performances scheduled for Saturday night, including those by LINKIN PARK, VOLBEAT and IN FLAMES. Tornadic storms with heavy rainfall pushing through eastern Oklahoma on Saturday evening caused widespread flash flooding in the area. There were an estimated 30,000 people attending the festivities on each day of the three-day event. This year's Rocklahoma was scheduled to feature about 80 current and classic rock acts, including TESLA, GODSMACK, SLAYER, BREAKING BENJAMIN, PAPA ROACH, HALESTORM, QUEENSRŸCHE and ANTHRAX.